The Holy Spirit intervened visibly in my life on two occasions. First, while I was driving on the Autobahn (super highway) in Germany, I got lost. I called out to the Holy Spirit, “Help!” Immediately my hands released the steering wheel. The wheel turned on its own, off the highway and onto the exit ramp, from the exit ramp onto a street. I then recognized where I was. My hands were given control of the steering wheel. I was surprised and amazed. I knew that the Holy Spirit had taken control of the car and me! A second incident showed me the Holy Spirit at work. While taking a shopping trip from Germany to Czechoslovakia, I had been sharing my experiences about the Holy Spirit with my traveling friend. She didn’t believe me. On the return from Czechoslovakia to Germany, in the wee hours of the morning on the Autobahn, my friend was driving while I slept. She woke me to point out something that was unclear and questionable in the fog down the highway. I could see taillights. I told her to move the car three lanes over, from the far left lane to the far right lane. I saw her hands on the steering wheel, turning the wheel to the right as we passed the unknown something on the highway. Then we heard loud crashing sounds behind us. We imagined there had been a pile-up of cars as they smashed into one another in the fog. My friend and I looked at each other. I said I was glad she had steered the car off to the right. She said she did not turn the steering wheel. I told her I saw her hands turn the wheel. She said she did not, and I told her the Holy Spirit did it. Twelve years passed after these two incidents in which the Holy Spirit had provided help and protection from danger. He then makes His presence known again with the flags. In 2003, while I was in church, praising God and dancing to music with one streamer in my right hand, the streamer—a form of a flag—“took off ” on its own. It was no longer under my control. It was in my right hand. I wasn’t moving it or directing its movement. It was if someone else was controlling my hand with the streamer in it. I was totally amazed. Something special had just happened. Th e Holy Spirit took control of my streamer. My question was, “Why now?” I had not asked for His help. I didn’t see any danger. Why did He do that? The reason for His intervention this time was not apparent like the other two incidents. I had been praising God. At that moment, I began a seven year journey to find the reason why the Holy Spirit had taken control of my streamer in church. The scriptures are full of references to color. As you scratch below the surface of verses, you can see what certain colors could represent. Colors are symbols. So, how is color a factor while ministering with the flags? In an earlier chapter, I talked about a banner being a standard or symbol erected on a pole. The color is the symbol or standard raised on a pole. Flag colors are symbolic of the nature, name, or attribute of the Lord. When we raise and wave a flag of a particular color, we are raising a symbol of a particular attribute of God or one of His names. Also, while raising this standard we are claiming to belong to who or what the symbol represents. All those who belonged to or who were apart of the house of Judah encamped under the symbol or standard of Judah (Numbers 2:3). Here is an example of how this may be used in ministry. Ezekiel 47:12 says leaves will serve for healing. Leaves are green. Green could be associated with healing. God is Healer. When we raise a green flag, we are raising a standard or symbol that shows God’s attribute of Healer. We are also showing that we belong to God who is Healer. When we raise a purple flag, we are raising a standard or symbol which shows God has authority and royalty and is King . When I raise a purple flag, I am declaring God is my King and that He has all authority over everything. I am identifying with the God who is all majestic. We can ask God to tell us or show us what color flags to use. The following pages show some colors that could be used. The best way to help you understand what I mean by a super- natural operation is to describe one that happened to me, that is, one that the Lord allowed me to see. Afterward I will tell you how this is relevant to the flags. As he spoke to her, a stream of water flowed from him to her. I looked around the sanctuary. Only a few people had remained. I looked wide-eyed at another lady who spoke with the same stream of water flowing from her mouth. I could see these streams of water going back and forth between people as they talked! I am convinced this stream of water is love. (Romans 5:5 NIV: “God has poured out his love into our hearts by the Holy Spirit, whom he has given us.”) Love comes from God to us and from us to others. I believe words spoken in love have substance and are visible in the supernatural. That love is a translucent stream of water, which flows like a river from one person’s mouth onto the person spoken to. It is beautiful, peaceful, gentle, and soothing. I am telling you this because it is evidence of an operation in the supernatural. God said, “Whoever believes in me, streams of living water will flow from within him.” That’s one supernatural operation. When praising, worshiping, and praying with the flags, another supernatural operation occurs. I am convinced that warfare on our behalf happens in the spirit or supernatural realm when we use flags with prayer, because Ephesians 6:11–18 (KJV) tells us to pray when the enemy comes, Jeremiah 50:2 tells us to raise a flag and say the enemy is taken, and Isaiah 59:19 KJV tells us the Spirit of the Lord will make the enemy flee or vanish. The Spirit of the Lord Will Make the Enemy Flee. The Spirit of the Lord will make the enemy flee. Sin and evil are enemies of the Lord. Sin was very prevalent during Old Testament times. Isaiah 59: 12-16 (The Message) says 12-15Our wrongdoings pile up before you, God, our sins stand up and accuse us. Our wrongdoings stare us down; we know in detail what we’ve done: Mocking and denying God, not following our God, Spreading false rumors, inciting sedition, pregnant with lies, muttering malice. Justice is beaten back, Righteousness is banished to the sidelines, Truth staggers down the street, Honesty is nowhere to be found, Good is missing in action. Anyone renouncing evil is beaten and robbed. 15-16God looked and saw evil looming on the horizon— so much evil and no sign of Justice. He couldn’t believe what he saw: not a soul around to correct this awful situation. The Spirit of the Lord responded to the presence of His enemy, evil. This is the supernatural operation that the Lord did then and does today against evil: The Spirit of the Lord puts on His battle armor. Isaiah 59:16-17 (KJV) says, therefore his arm brought salvation unto him; and his righteousness, it sustained him. 17For he put on righteousness as a breastplate, and an helmet of salvation upon his head; and he put on the garments of vengeance for clothing, and was clad with zeal as a cloak. Why did He put on His armor? He was preparing to do battle against His enemies because He is a God of vengeance. After He puts on His armor, what does He then do? He repays his enemies for what they have done with fury. Isaiah 59:18 (KJV) says, According to their deeds, accordingly he will repay fury to his adversaries, recompense to his enemies; to the islands he will repay recompense. Exactly how does God repay His enemies? The spirit of the Lord repays his enemies by lifting up a standard against them. The Hebrew Chaldee Dictionary (5127) says “shall lift up a standard” comes from the root word “nuwc” which means to vanish away, make to flee away, put to flight. “When the enemy shall come in like a flood, the Spirit of the LORD shall lift up a standard against him” (Isaiah 59:19b KJV). This is a supernatural operation. For our protection, we are told to put on (spiritual) armor. This means we must use the supernatural weapons God has available to us, e.g., truth, righteousness, peace, faith, salvation, and the Word of God, to come against the evil of this world. Ephesians 6:13–17 (KJV) says: 13 Wherefore take unto you the whole armor of God that ye may be able to withstand in the evil day, and having done all, to stand. 14 Stand therefore, having your loins girt about with truth, and having on the breastplate of righteousness; 15 And your feet shod with the preparation of the gospel of peace; 16 Above all, taking the shield of faith, wherewith ye shall be able to quench all the fiery darts of the wicked. 17 And take the helmet of salvation, and the sword of the Spirit, which is the word of God. God allowed Joshua to see into the supernatural realm. The Lord fought a battle for the Israelites because the battle was His and not theirs. The Lord is the commander of the army of the Lord in Joshua 5:9–15 (KJV). Also, Jesus is the Captain of the Lord’s Host. He is our Captain. 9And the LORD said unto Joshua, This day have I rolled away the reproach of Egypt from off you. Wherefore the name of the place is called Gilgal unto this day. 10And the children of Israel encamped in Gilgal, and kept the passover on the fourteenth day of the month at even in the plains of Jericho…. 13And it came to pass, when Joshua was by Jericho, that he lifted up his eyes and looked, and, behold, there stood a man over against him with his sword drawn in his hand: and Joshua went unto him, and said unto him, Art thou for us, or for our adversaries? 14And he said, Nay; but as captain of the host of the LORD am I now come. And Joshua fell on his face to the earth, and did worship, and said unto him, What saith my Lord unto his servant? 15And the captain of the LORD’s host said unto Joshua, Loose thy shoe from off thy foot; for the place whereon thou standest is holy. And Joshua did so. The Captain of the Lord’s host goes ahead of us and fights the battle. Again 2 Chronicles 20:15 (KJV) says “the battle is not yours, but God’s.” Another instance where the Lord does battle in the supernatural is described in Isaiah 31:5–9 (NIV). We see that by the mere sight of the battle standard (flag) the enemy will panic: 5 Like birds hovering overhead, the LORD Almighty will shield Jerusalem; he will shield it and deliver it, he will “pass over” it and will rescue it. 6 Return to him you have so greatly revolted against, O Israelites. 7 For in that day every one of you will reject the idols of silver and gold your sinful hands have made. 8 Assyria will fall by a sword that is not of man; a sword, not of mortals, will devour them. They will flee before the sword and their young men will be put to forced labor. 9 Their stronghold will fall because of terror; at sight of the battle standard their commanders will panic, declares the LORD, whose fire is in Zion, whose furnace is in Jerusalem. These are supernatural operations. The operation that is being carried out is warfare. That is, warfare in the supernatural realm. So, why use the flag with praise or worship in a church or home? 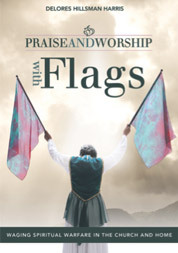 We can use the flag with praise and worship for warfare, more specifically, supernatural warfare. We engage in supernatural warfare when we pray with the flags.